Having to go back through all your jobs to manually update them can take a lot of time. Auto Update Rules are a great way to save time and streamline your workflow! When certain conditions are met, these rules you set will automatically update your jobs. For example, you can set a rule that auto-assigns your Billing Team when a Job is Invoiced. To add an Auto Update Rule, click on Settings > Automation > Auto Update Rules (under Automation). Click on the blue +Add button to create a new rule. Click Save to save your rule and activate it. The only required field is the Rule Name. You can leave any other field blank if it is not required. That's it! 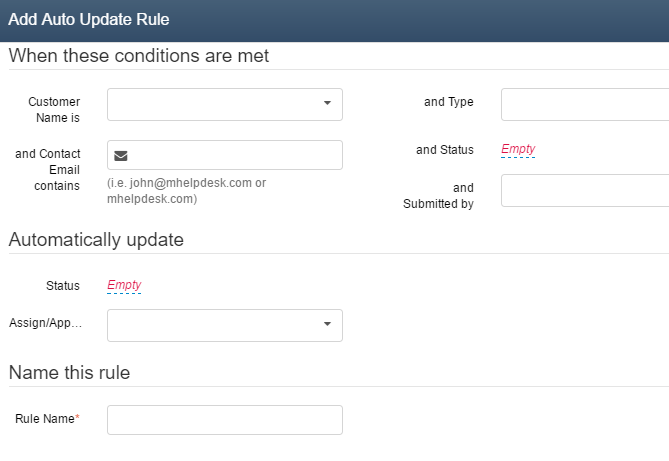 Now your rule will simplify how updates are handled in your mHelpDesk account.